Forecasters warn that the storm could strengthen into a 'bomb cyclone,' packing hurricane-force wind, coastal flooding and as much as a foot of snow. Forecasters warned that the same system could soon strengthen into a “bomb cyclone” as it rolls up the East Coast, bringing hurricane-force winds, coastal flooding and as much as a foot of snow. By the time the morning’s dreary sleet and rain turned to fluffy snow, Savannah came out to play. Families with children flocked to Forsyth Park near the downtown historic district for snowball fights. The National Weather Service recorded 1.2 inches of snow — Savannah’s first measurable snowfall since February 2010 and the first that exceeded an inch (2.5 centimeters) in 28 years. Across the Georgia-South Carolina line in Charleston, the weather service reported 5 inches as the snow was winding down at 5 p.m. That’s the most snowfall in Charleston since December 1989, and plenty for Chris Monoc’s sons, ages 4 and 2, to go sledding outside their home near the city’s iconic Ravenel Bridge. Airports shut down in Savannah, Charleston and elsewhere as airlines cancelled 500 flights Wednesday, and at least 1,700 more were cancelled Thursday. Interstate 95 was nearly an icy parking lot for almost all of its 200 miles in South Carolina. Troopers couldn’t keep up with the number of reported wrecks which numbered in the hundreds. 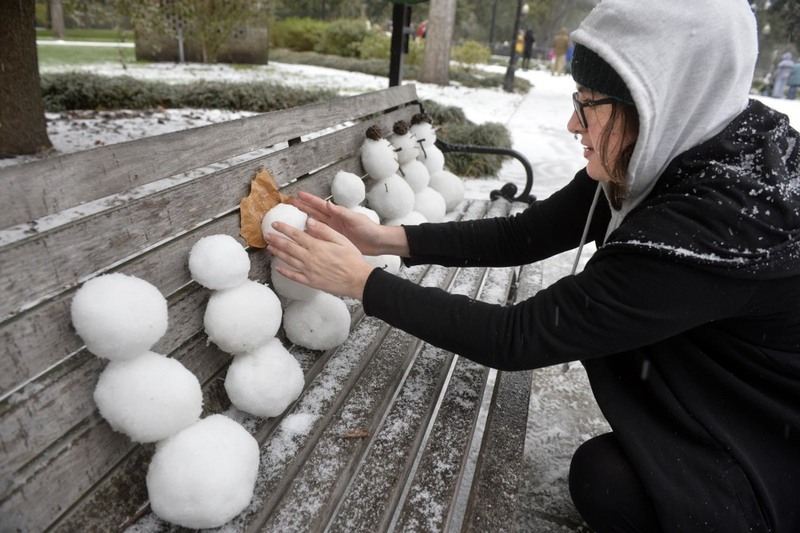 In Tallahassee, Florida, Michigan transplant Laura Donaven built a snowman 6 inches tall. The city tweeted that snow fell there for the first time in 28 years.